My coworkers have enjoyed seeing my cubicle-sized mini quilts that match my larger monthly wall hangings that hang at home. I made ones for January, February, and March before getting distracted by plenty of other projects. 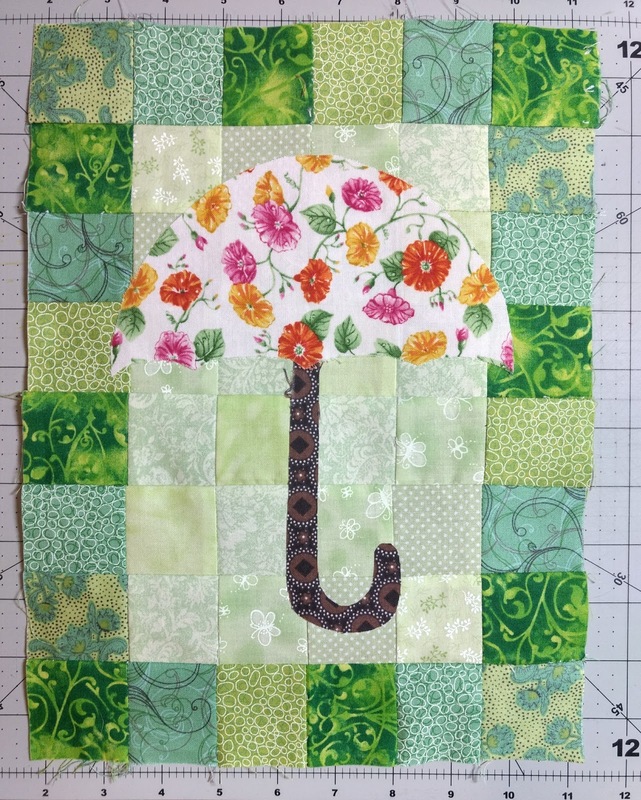 To make the April cubicle mini to match the April wall hanging at home, I decided that my cubicle mini would just have a scaled down umbrella (thank you, Google Images clip art machine). 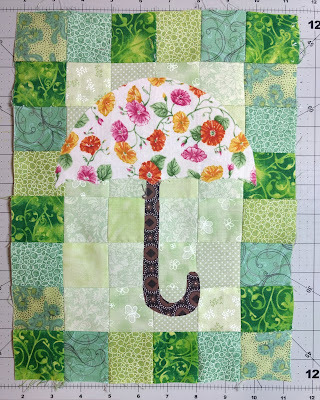 I had made the pieced background for this over a year ago in shades of green. I picked a larger floral print for the umbrella and brown for the handle. For the satin stitching, I used brown on the handle and pink around the umbrella. 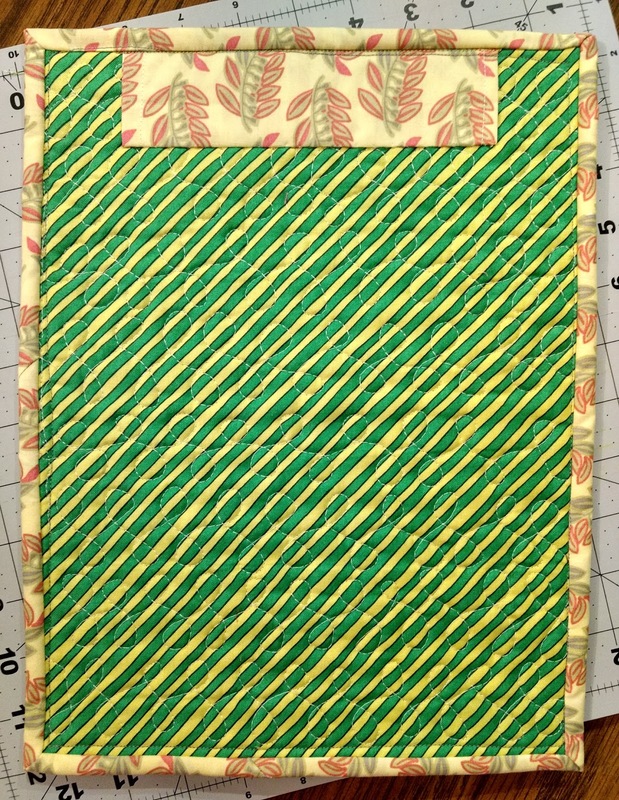 For the quilting, I used a green and yellow variegated thread in rows of loops. 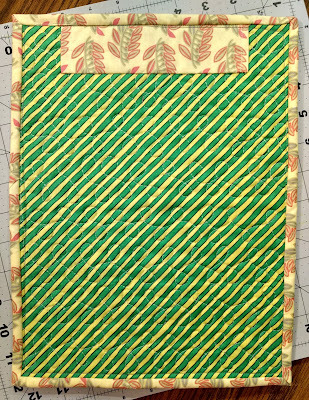 The backing is an old yellow and green stripe from my stash and the binding is a yellow, green, and pink leafy print left over from some older baby quilts that I made (in approximately 2013!). This will be going up in my cubicle on April 1st! Now I have over a month to try to get one done for May. Sharing at Finish it up Friday and Oh Scrap! 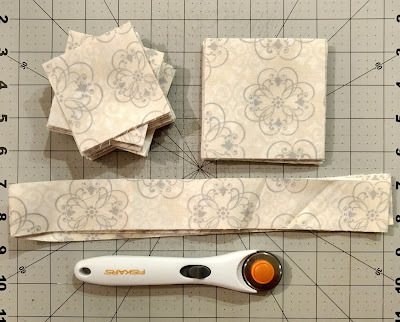 I like to have a "quiet project" to work on so that I don't drive my husband completely crazy with the sewing machine running all waking hours. Usually I have something that needs pressing or trimming that I'll work on in the evenings while we watch baseball or basketball. My new Double Delight project has provided me with PLENTY of pressing and trimming as of late. After finishing up pressing 120 square in a square units, I had to trim 120 square in a square units. This took me quite a while to trim in between working on other things and I made a lot of pretty trash in the process. I went ahead and stacked these units into four piles of 30 so I won't have to recount the stacks when I am ready to make the blocks! I'll just rotate the units so that the fabrics are in a variety of locales within the block. I think that I used approximately ten different chartreuse fabrics and about eight different mulberry fabrics. I had quite a lot of certain mulberry fabrics (like the cream/mulberry floral left over from the backing of my Stash Bee Star Quilt) and a mulberry batik tonal fabric. When I picked up my new sewing machine, I also picked up a half yard of a cream print that matched well with the other two cream prints I had started using for this quilt. It was more difficult than I anticipated to find something that had a similar shade of cream in the background! It definitely won't be enough cream for the rest of the quilt, but it's more than enough to continue adding sides to my other set of 120 square in a square units and my nine-patch sections as leaders and enders until the next time I venture out to the quilt store. My hope is that the more "traditional" quilt store in the opposite direction might be a better source for cream fabric! Maybe I'm just being too particular about the shade of cream for a "scrappy" quilt? I think that a more cohesive background color -- even if I end up using 4-6 different fabrics -- will help the blocks stand out more than something more scrappy -- what do you think? Sharing at Let's Bee Social and NTT! 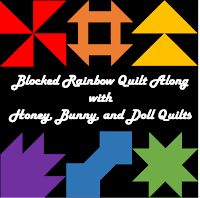 Welcome back to the Blocked Rainbow QAL! 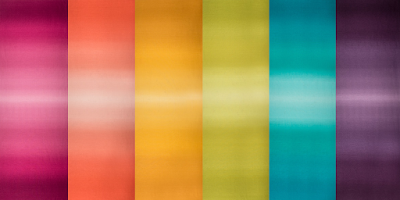 Today's post is a prep post for those of you who have already chosen your background fabric. 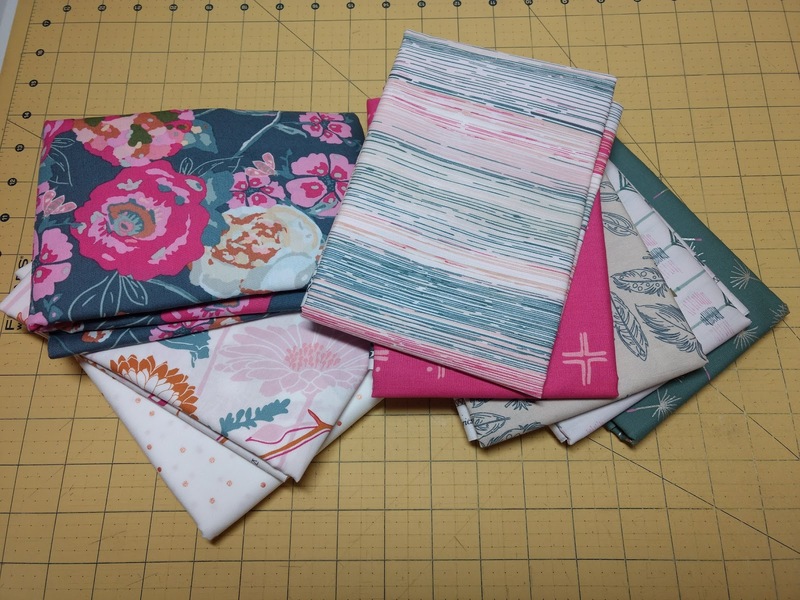 If you haven't chosen your fabric yet, you can come back to this post when you do! If you'd like to cut your large background spacers before you start cutting your fabric for the blocks, here are those measurements. Remember that you only need to cut one set of 5 total spacers! And don't forget to save the "stubs" these strips to use for cutting block parts later! I'd also like to share about the sponsors and giveaways for this quilt along! This year, we'll have pattern giveaways every week for those who post some sort of progress post by Sunday after a new pattern is released. We'll also have pattern bundles and fabric giveaways in conjunction with the quilt top parade in June! If you haven't decided on your fabrics yet, here are a few suggestions! These are not affiliate links, these are other color schemes I would pick for myself! -If you don't want to use purple in the quilt, you can use teal for your blue blocks and blue for your purple blocks. -Using a pink instead of a red is always an option! -If you use a blue for your background, make sure that it contrasts well with what you plan to use for your blue blocks. I'm excited to see some quilts with sky blue backgrounds! -If you use a white background, consider using a richer or deeper yellow for contrast. Please share your fabric pulls on Instagram with the #BlockedRainbowQAL hashtag and in the HBD Quilts Facebook Group! 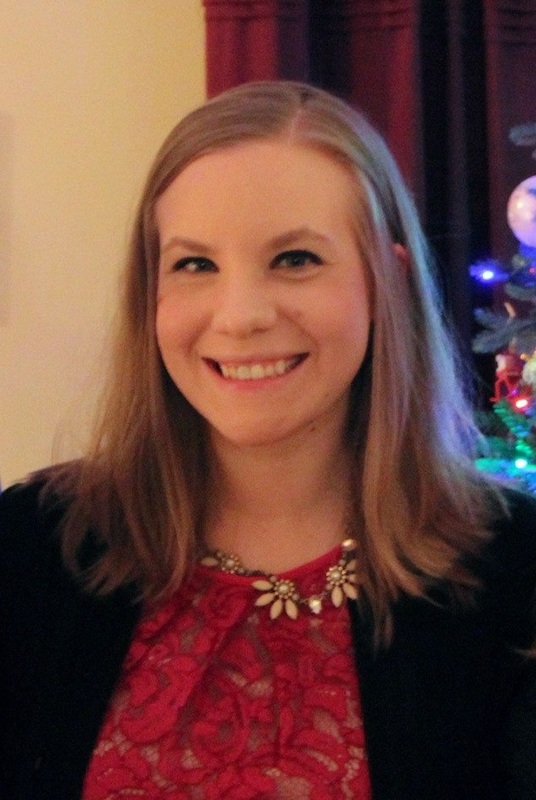 I am so excited to start sewing with you next week! 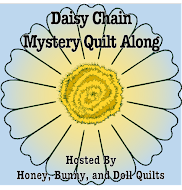 If you're interested in joining in as a sponsor, please email me at littlebunnyquilts@gmail.com! I had originally thought about making a mini quilt from the blocks, but decided to add four purple squares with the blocks and made a table runner instead! 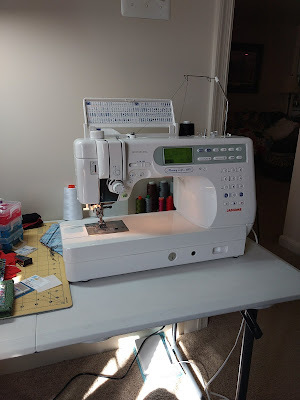 Another new thing I got to try with this project is my BRAND NEW SEWING MACHINE! Meet Marcie, my Janome Memory Craft 6600P. As I remarked on Instagram, the only thing that's missing is a cupholder! 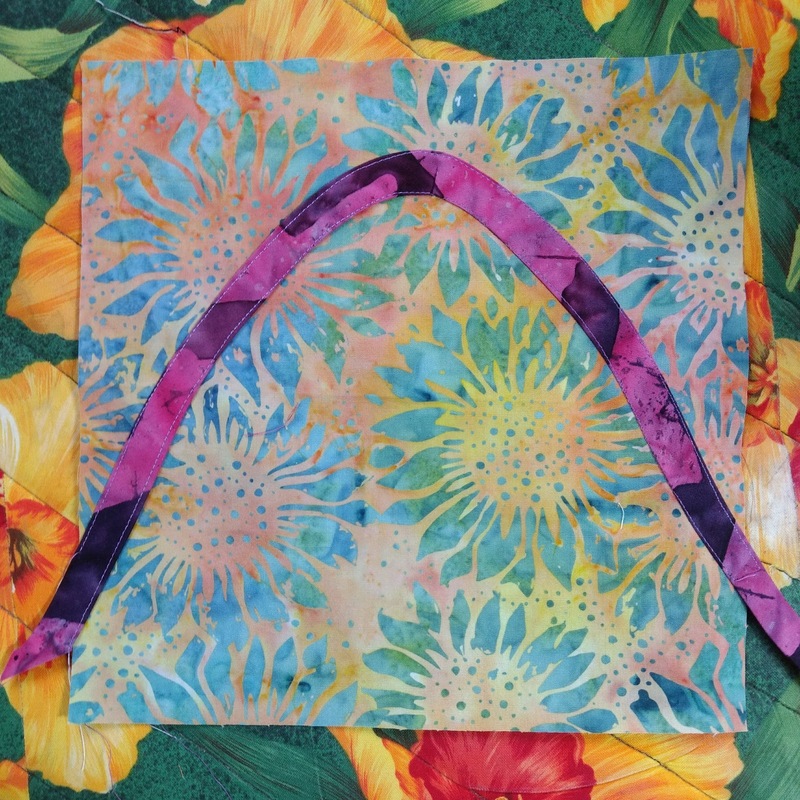 Working on a little project like this table runner was perfect to test out the different settings for straight stitching, free motion quilting, and all of the different feet! For the quilting, I used a purple and pink variegated thread from Superior Threads with purple 50 wt. Aurifil in the bobbin and did a simple all over meander. 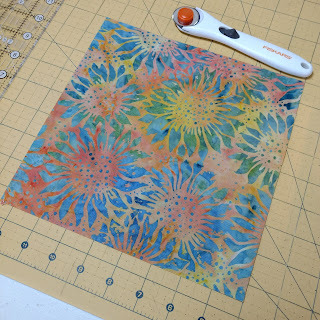 The backing is an aqua coordinate of the Sunflower Serenade line. I used a fat quarter of one of the pink floral prints for the binding and used one of the decorative stitches on my machine to do the top stitching (also using the variegated/Aurifil top/bobbin thread combination!). All in all, I'm very excited about my new machine (which I can guarantee you'll hear more about!) and adding bias tape applique to my portfolio of quilting skills! 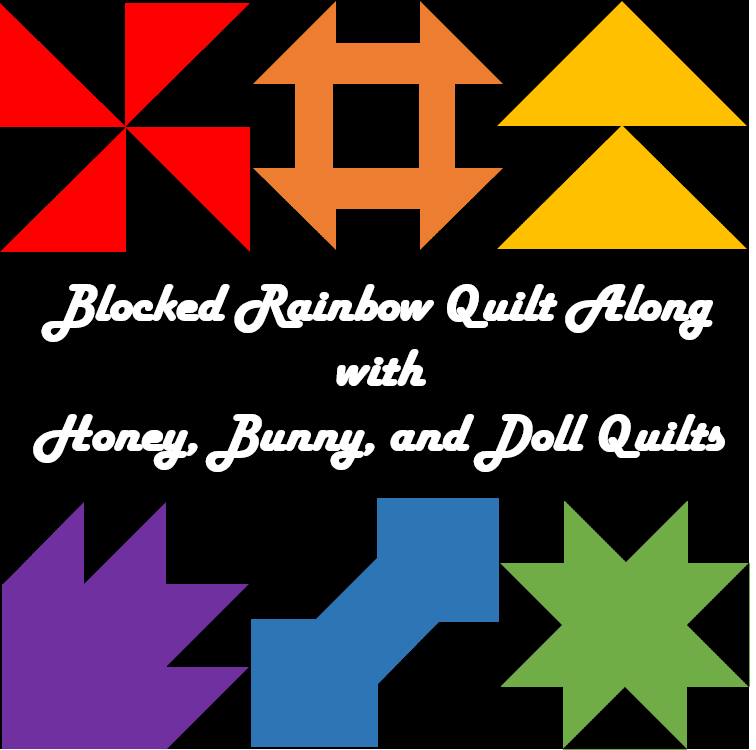 Don't forget to join in the Blocked Rainbow QAL! Block directions don't start being released until April 2nd, so you have plenty of time to start gathering fabrics! 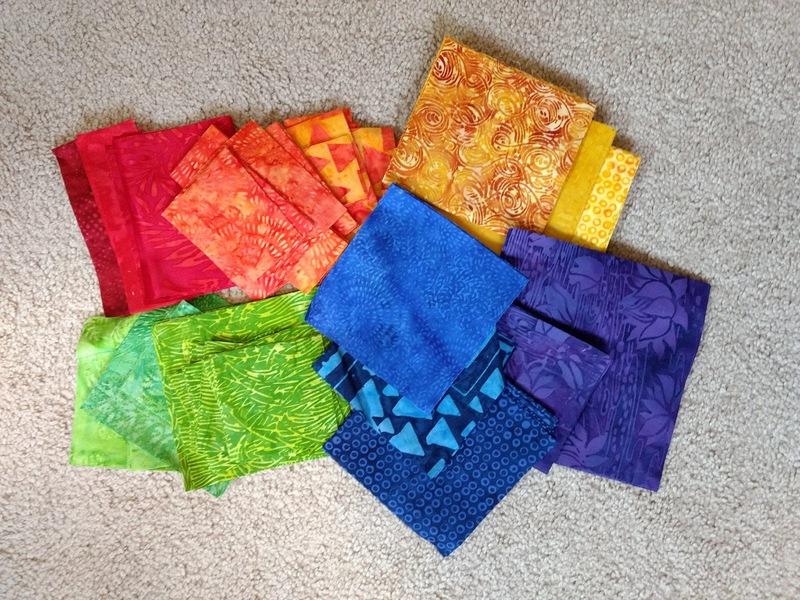 Our Kona sale is for a short time only so grab what you need for the QAL or just stock up! Sharing at Finish it up Friday and Linky Tuesday! 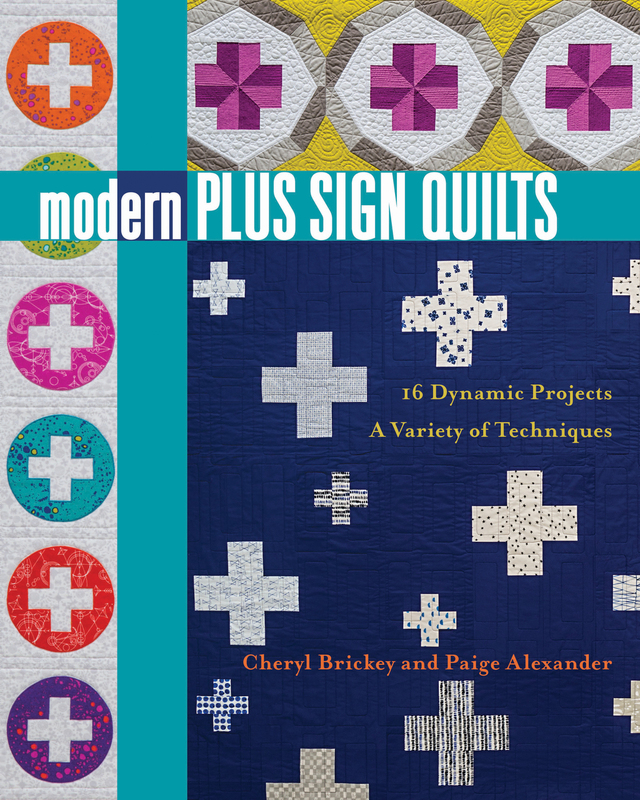 Today is my day to share as part of the Modern Plus Sign Quilts blog hop! I am so honored that Cheryl and Paige have asked me to make a quilt for the blog hop celebrating the release of their wonderful book! This book is extremely fun because it incorporates a wide variety of different techniques to create striking modern quilts! I decided to make a version of this quilt with 16 blocks for a boy baby quilt with blue and grey fabrics from Lily and Will Revisited by Bunny Hill Designs. I love the original quilt -- the grey pinwheels with the white background allow the colored plus signs to really pop -- so I wanted to keep my version similar but exchanged the pink for light blues. I used a 4x4 layout instead of a 6x6 layout, so my quilt top is approximately 40" square with the borders that I added. I quilted this with simple loops and used the blue plaid fabric as the binding. Please check out the other bloggers on the hop as well as this wonderful new book! 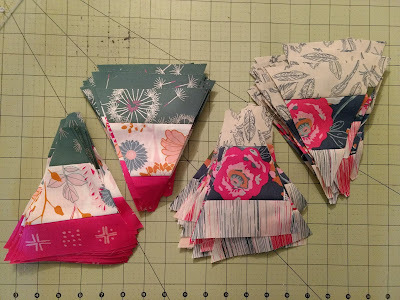 My latest QAL just started and I'd love for you to join! Also sharing with NTT! To start - why this quilt? 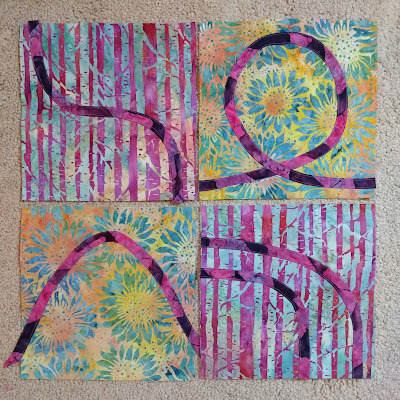 I chose this quilt as it's a great project for quilters of any skill level. 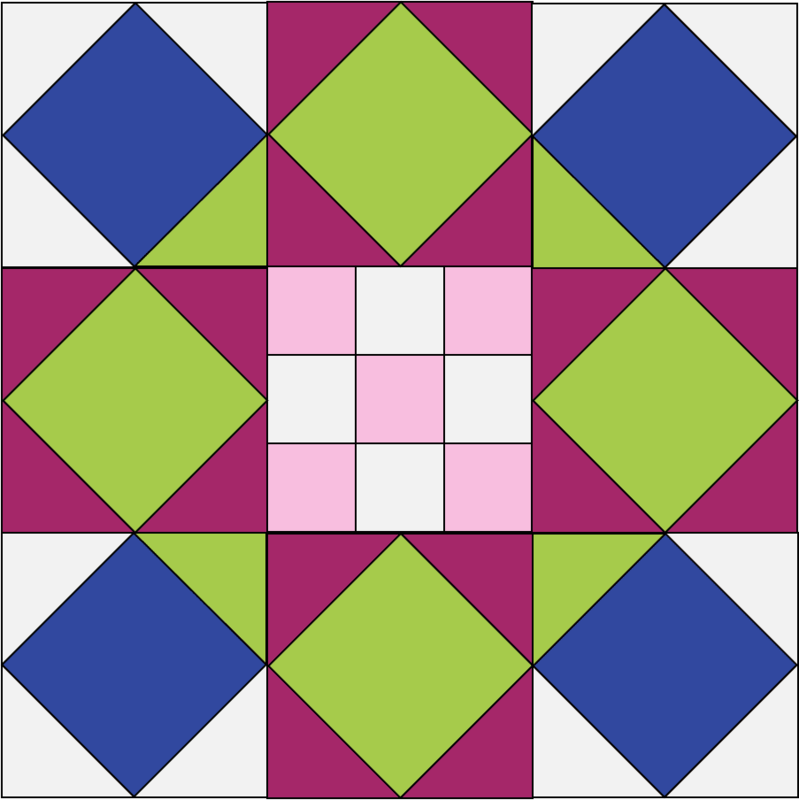 The individual blocks use basic quilting techniques but is more modern than your standard sampler. It is a sampler in that you're using a variety of different blocks, but uses the blocks to create the secondary rainbow design. 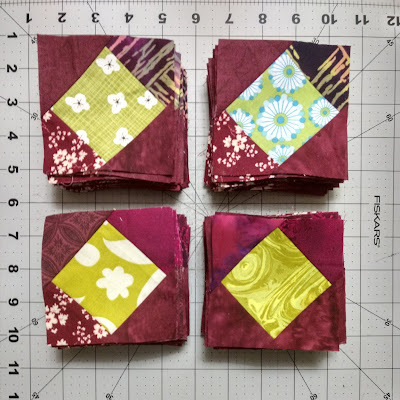 With individual blocks, it's easy to modify this to be a scrappy quilt or to make each set of blocks in a single fabric, as I did in the original. 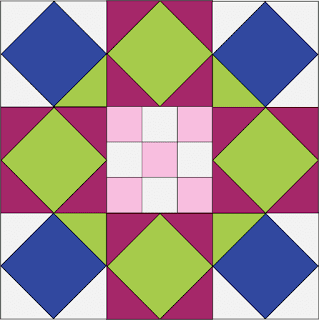 This quilt along also has the option to make larger blocks in the same patterns to make a twin sized quilt! I'll be sharing suggestions as we go along if you're making a scrappy version. For my quilt, I'm using a variety of Island Batik fabrics that I set aside from last year's Island Batik Ambassador boxes and some that I pulled out from this year's box! I'm going to use Kona Black for my background. I'm using 3-4 different fabrics for ROYGB and one purple fabric. 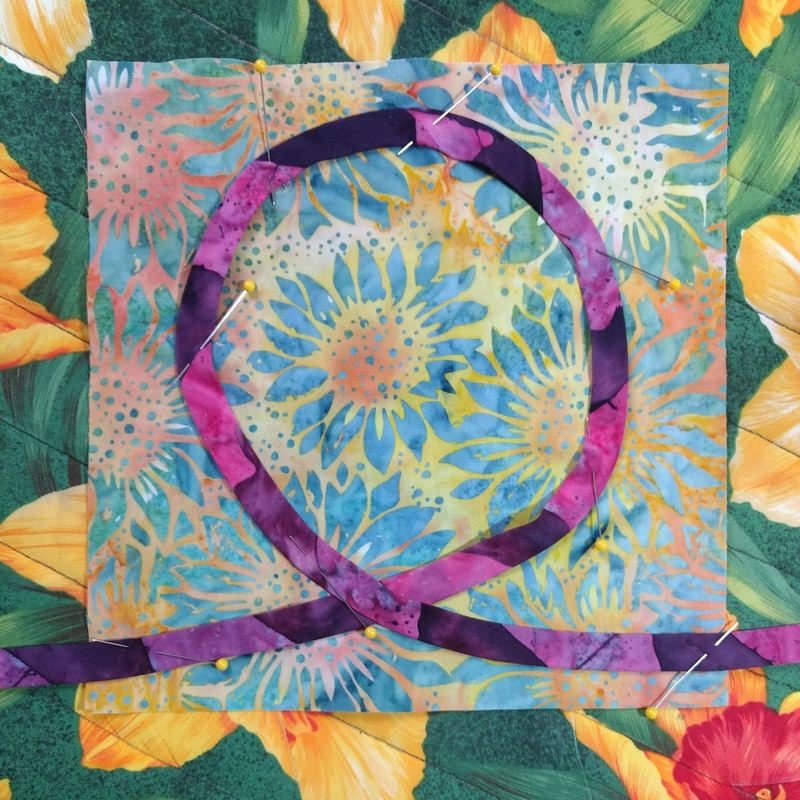 We hope that you will join in on making a fun quilt! Join our Facebook Group and use the hashtag #BlockedRainbowQAL on Instagram to share your pics and progress! 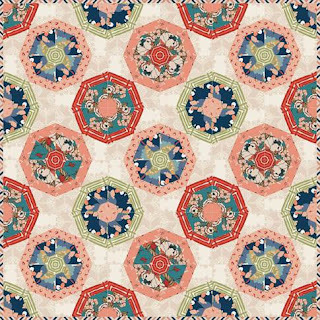 Now that my main scrappy projects from last year (Top Spin, On Ringo Lake, Magnolia Mystery Quilt) are done being pieced, and my Donuts quilt is getting closer and closer to being ready to assemble, I have been searching and contemplating a new scrappy project for myself. I considered a lot of things, wanting a project I could pick up and put away easily as well as could be easily adapted to leaders and enders (because Donuts isn't great for leaders and enders!) 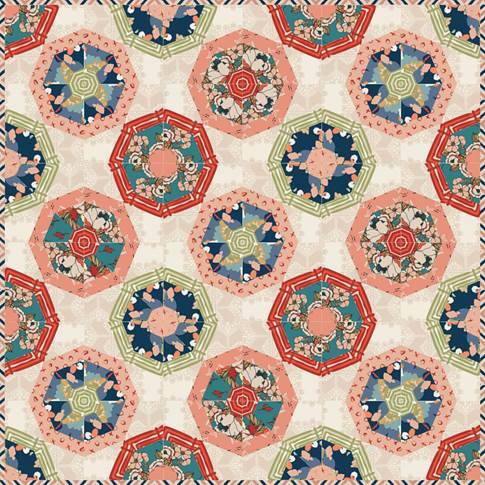 and settled on Bonnie Hunter's Double Delight pattern which is free on her site. My color scheme will be identical as the original excepting subbing in chartreuse for cheddar and mulberry for brown. I drew up a mock version of what the Rolling Star block would look like in my color scheme and I like it very much! Since I got a little too excited about starting the cutting for this quilt, I didn't realize until most of the way through the cutting that I don't actually have enough cream or pink scraps in the right shades for the whole quilt. Oops. I did have enough fabrics for the navy, mulberry, and chartreuse sections, but just barely! 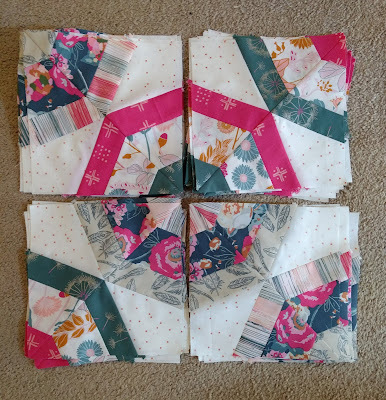 I did as much sewing on the corner square-in-a-square units as my fabrics would allow -- I got all of the green corner triangles sewn, and about half of the units have one cream corner triangles attached. I have all the necessary units cut for the side square-in-a-square units, so that has been my side project/leader and ender project over the last two weeks. I'm done with these units and they are ready to be trimmed to size! I have quite a few pink and cream strips sewn and trimmed into sections for the nine-patch blocks, but will have to make lots more. I am sticking with the two pink-one-cream units until I have enough and then I'll switch to the two cream-one pink units. My plan is to pick up a few fat quarters and half yards of the right shades of cream (I'll need approximately 2 yards more of the cream!) and pink (I'll need to add in about a yard) each time I am near one of my local quilt shops (or semi-local, rather -- all of them are about a half hour away). This is mainly going to be a leader and ender project and I still have lots of sewing I can on these units until I actually am going to physically need cream and pink fabrics in my possession to add in to the quilt. Sharing at Let's Bee Social! Good morning, quilt friends! 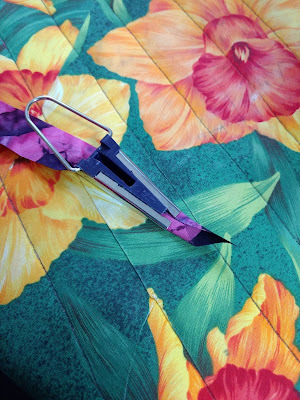 Today I'm joining in with the Fat Quarter Shop and Art Gallery Fabrics for the Odori Quilt Hop! This is a fun strip piecing quilt that uses the spider web ruler from Creative Grids (not an affiliate link) and you can get the pattern here! 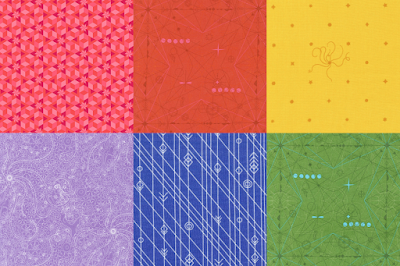 The original quilt (and quilt kit!) 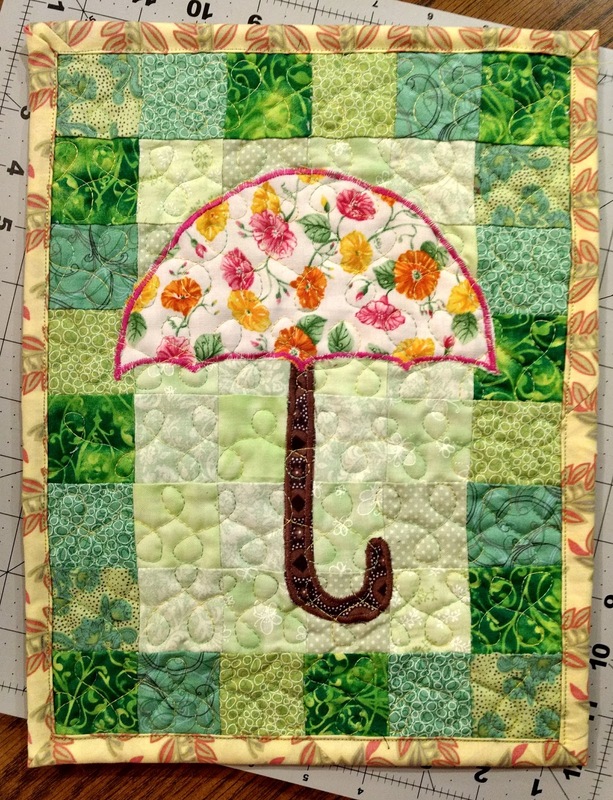 uses Love Story by Maureen Cracknell -- I used the Bachelorette Fusion line for my quilt. The fun thing about this quilt is that you don't need that much of any one print! I enjoyed being able to pick out and play with these fabrics. 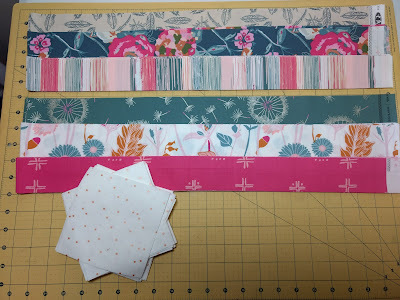 Since you cut your strips in different sizes, I used the two larger prints for my larger width strips. I also made sure that my strip sets had lots of contrast! 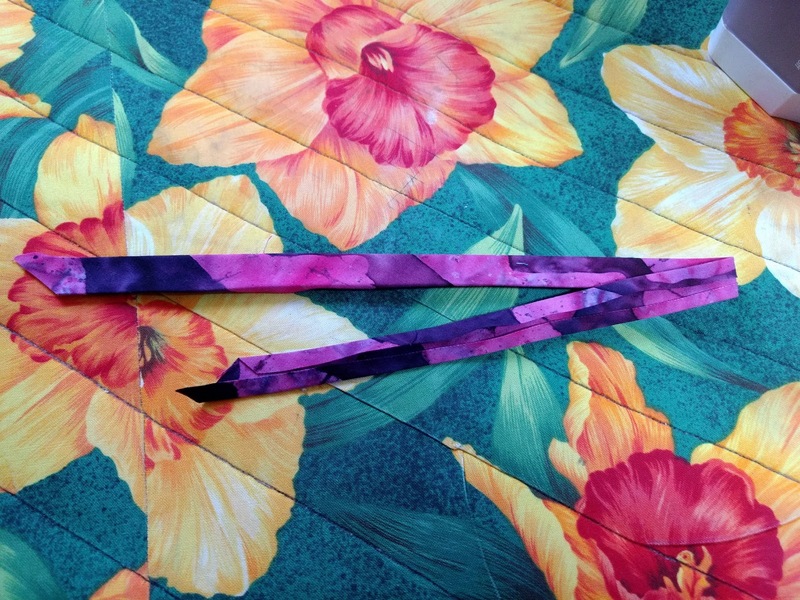 One little tip: If you stagger your strips when sewing your strip sets, you can usually get an extra triangle or two out of your strip sets! Use your ruler to estimate where to line things up. Another tip! 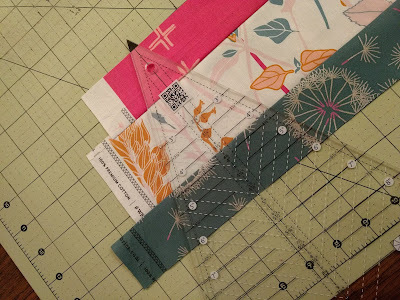 If you press half of your strip sets one direction and half of your strip sets in the other direction, you can nest your seams once you're putting your blocks together! I like that just two different strip set arrangements can make different looking blocks! Here are all four of my blocks laid out before I made the larger blocks. My blocks went together so easily! I also have to say that I am in love with the metallic polka dot background fabric. I think this is going to be a perfect little baby quilt! 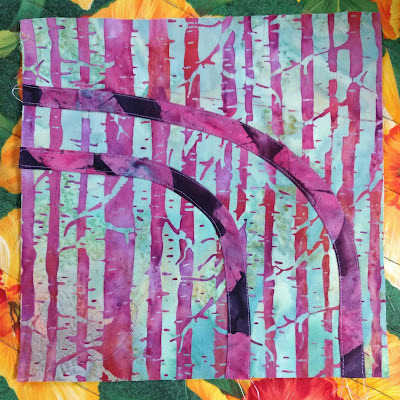 For the quilting, I did simple loops all over the quilt! I used some flannel for the backing and the quilting went so quickly! I used the fun stripe from this line for the binding. This is such a sweet little quilt! Thanks for stopping by and don't forget to share pictures of your own version of this quilt on Instagram with the hashtag #OdoriQuilt! 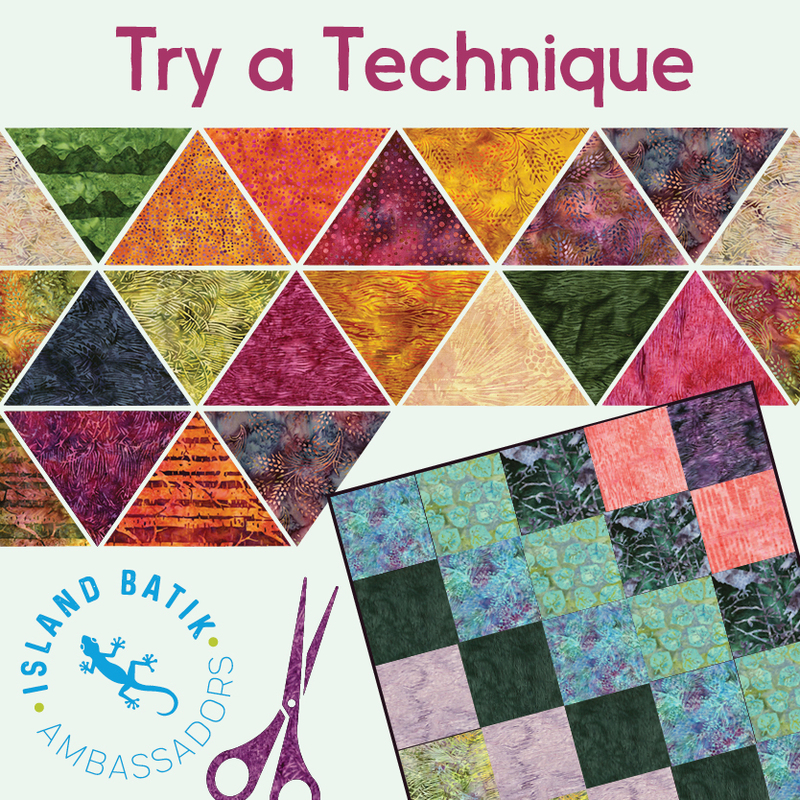 This month our Island Batik Ambassador challenge is truly a challenge -- we have been tasked to "try a technique" -- something that we've never done before! 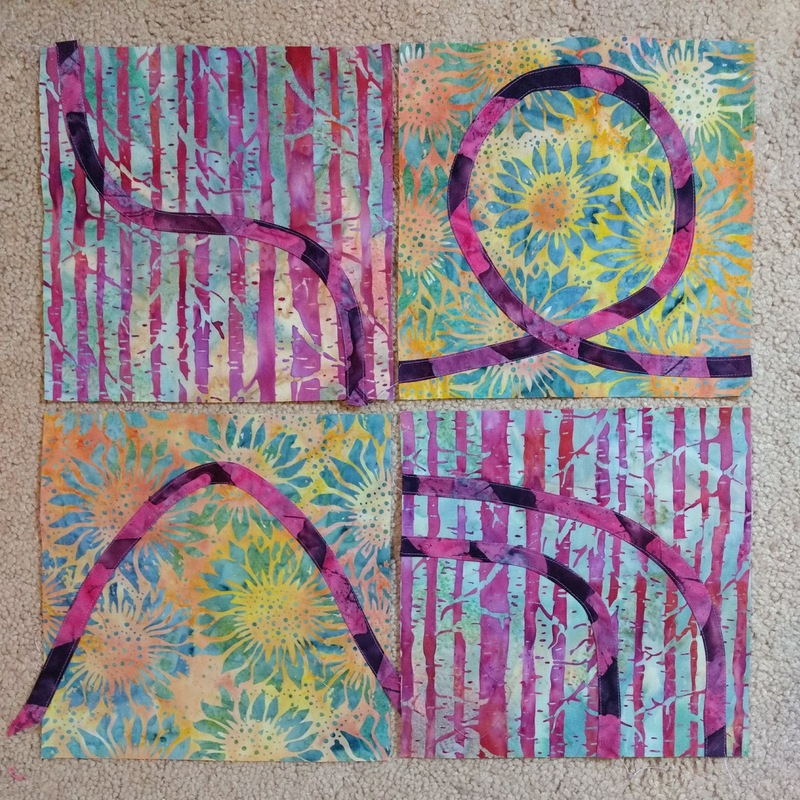 I've used quite a variety of techniques in my nearly 15 years of quilting! 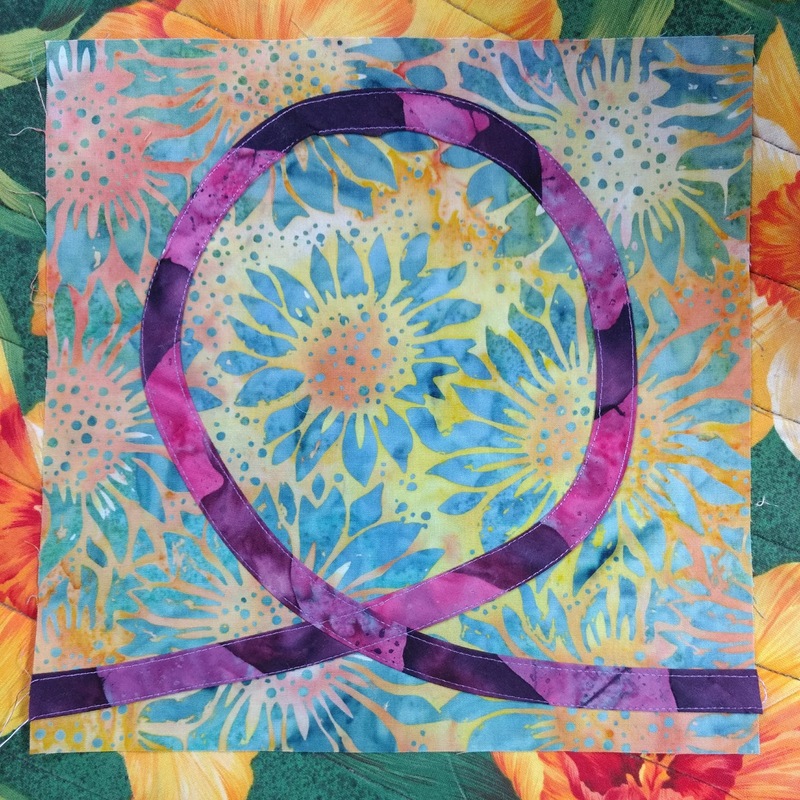 Hand applique, machine applique, templates, paper piecing, free motion quilting, quilt as you go, walking foot quilting, mystery quilts, quilt alongs, designing quilts, strip piecing, leaders and enders, improv piecing, to name just a few! It was slightly difficult to come up with a list of techniques that I haven't tried that I was interested in trying! I'm not necessarily interested in garment making or bag making, which were my first two ideas. I ultimately decided what I wanted to work on this month was to make a mini quilt or table runner that used bias tape applique. I didn't want to pick something that I would potentially do once and abandon -- I think bias tape applique is a good skill to add to my arsenal! 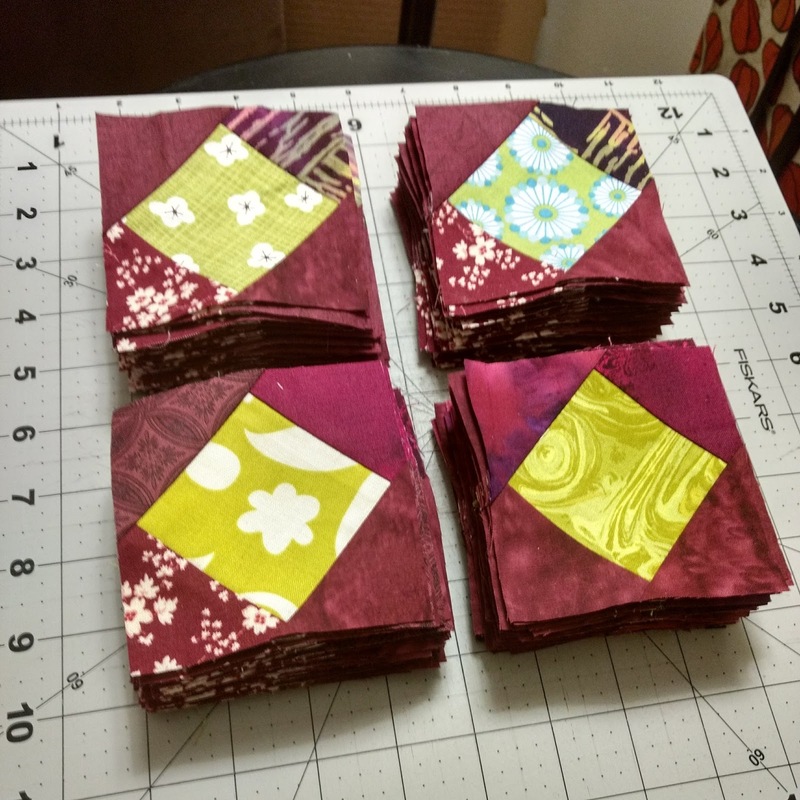 I pulled a few fat eights from my Sunflower Serenade bundle to work with for this project, which I think will end up being a table runner. 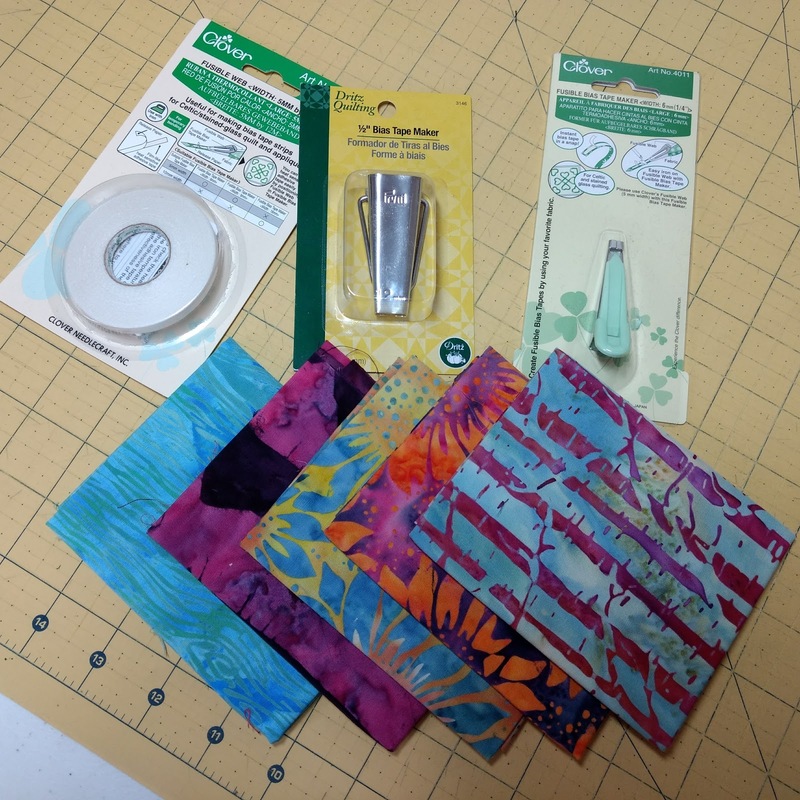 I started working with the wider 1/2" bias tape maker and cut my own strips of fusible web because the roll above is only 1/4" wide and supposed to be used with the smaller 1/4" bias tape maker on the right. I cut 8.5" squares from two different fabrics and these are going to act as my block bases. 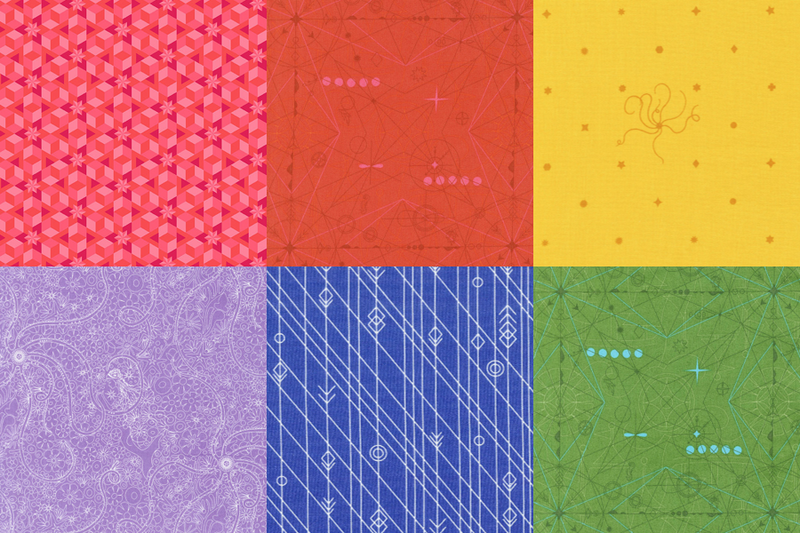 I "drew" various curved lines on four different blocks. After ironing on the fusible strips, I pinned my desired curves, pressed the strips to the block base, and used purple thread to attach the strips to blocks. Now to decide how to put these together! I'm not sure if I am going to add more blocks with applique or additional plain blocks. Are there any techniques that you haven't tried yet that you're itching to try? Any tips for me in my bias tape adventures? 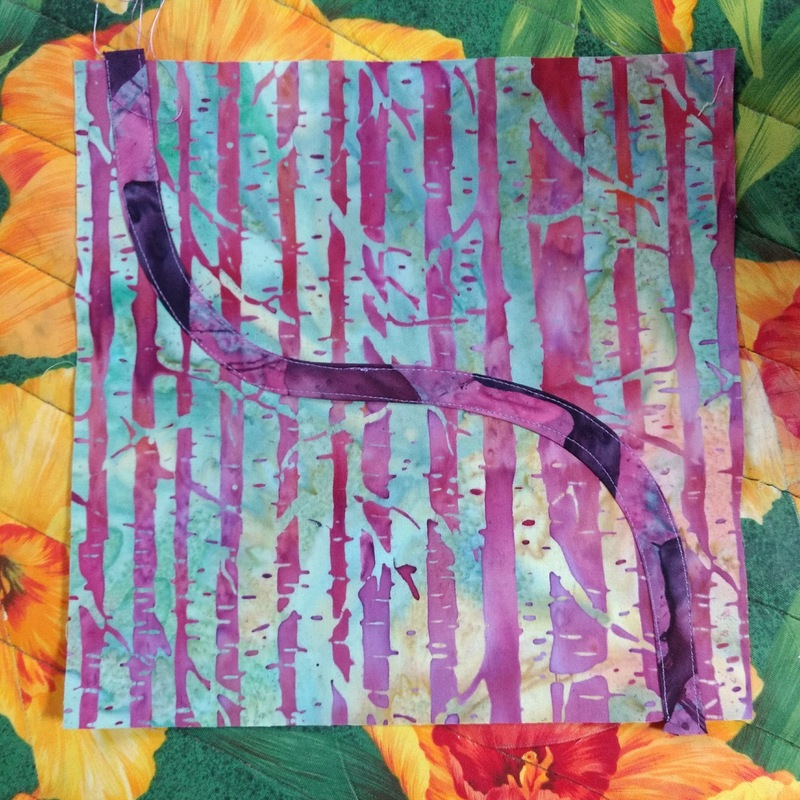 Today starts the Magnolia Mystery Quilt Parade at Meadow Mist Designs! My quilt top is included today!